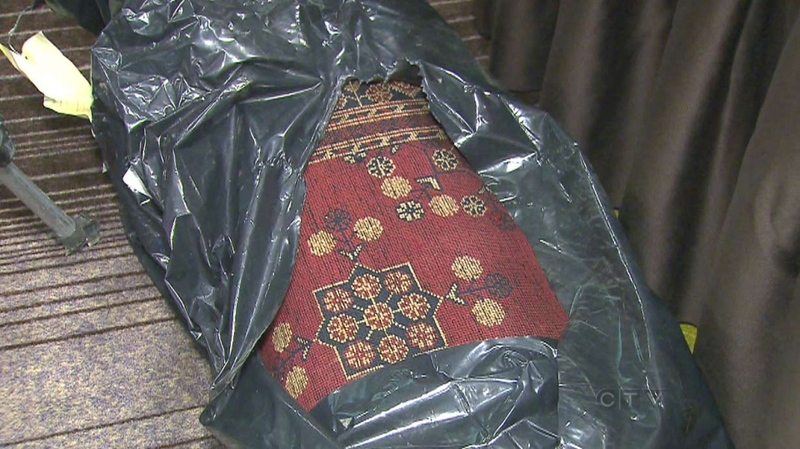 TORONTO -- More than a dozen kilograms of heroin woven into carpets shipped to Toronto's airport are among the drugs seized by police and border agents, who say they have interrupted an international trafficking ring. Eleven people, mostly residents of the Greater Toronto Area, are facing 76 drug charges in the investigation that police have dubbed Project Infinity. The joint investigation between provincial and Toronto police as well as the Canada Border Services Agency began in June 2010, when border services agents at Pearson airport found 15 kilograms of heroin hidden inside 27 carpets that arrived from Pakistan. The drug had been put into the main support strands and the carpets were woven around them, likely by people who were paid almost nothing for their labour, police said. In total throughout the investigation police seized 160 kilograms of ephedrin, which is used to make crystal meth, 24 kilograms of heroin, 20 kilograms of ecstasy, four kilograms of crystal meth, a kilogram of cocaine and nearly a kilogram of opium. Ontario Provincial Police Commissioner Chris Lewis found the amount of heroin particularly shocking. The Toronto police have more experience in heroin investigations, but 24 kilograms is a large seizure, even for them, he said. "In 35 years on the OPP I've never ever held a kilo of heroin in my hand and I've worked on a lot of investigations," Lewis said. "But these are huge numbers, even for Toronto." It's hard to say whether the seizure illustrates a growing problem, Lewis said, but he did note that law enforcement officials predicted that when OxyContin was taken off the market in Canada heroin would become the drug of choice. More than half of the heroin seized in the investigation was found in the carpets. Border agents also found 4.8 kilograms of the drug hidden inside a wood crate used to ship crockery and decorations in June 2011. Earlier this year, border agents at the airport in Hamilton found about 1 1/2 kilograms of heroin inside two silver plates that were fused together to make them look like one. The ephedrin was found in Calgary inside containers of vanilla powder shipped from India, border services said. Authorities also intercepted a package from Peru in 2011 containing a kilogram of cocaine and that same year U.S. customs agents in Nashville, Tenn., found 250 grams of cocaine inside a wooden clock shipped from Guatemala and destined for Canada. Police descended on eight homes and businesses across the Toronto area, including in Mississauga, Toronto, Markham, Stouffville, Newmarket and Oshawa. The 11 people charged range in age from 24 to 28. As police executed their search warrants Tuesday they say they found more drugs, including two kilograms of heroin, and proceeds of crime including about $538,000 cash, and six vehicles. Another six people who were already before the courts were charged with more offences. Police say more than a dozen kilograms of heroin woven into carpets were shipped to Toronto's airport.